Oval Cut Diamonds – Making a Solid Come-Back! Anyone else seen a growing obsession with Oval-Cut diamonds lately? Isn’t it so crazy? Social media influencers and top jewelry instagram accounts are literally beaming with oval cut engagement rings, and we just can’t get enough! Just in the last few months, the trends and fads have changed drastically for these uniquely-cut gorgeous diamonds! Talk about a trend-setter stone! These trends are what allow the diamond market prices to fluctuate. And, especially in the case of this magical and royal shape. A fun history fact – per our families experience in selling diamonds for over 30 years. There was a time where we couldn’t give an oval-cut diamond away for free! It was poorly desired, no matter size, color or clarity. 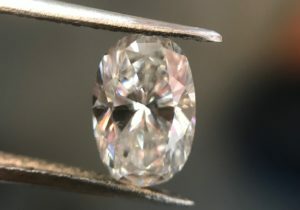 Many diamond dealers, including my family, often converted these oval-cut diamonds into more desirable shapes such as radiant and cushion cut. Fast forward a couple of decades, today the oval-cut brilliant diamond is one of the hottest selling stones, even to the point where many diamond dealers are now re-cutting marquise diamonds to create additional ovals in the marketplace! shape or outline – everyone wants the “ideal” shape which means the length and width must be between certain parameters for it to be considered the “ideal” ratio. personalities of the diamond – how does a specific oval cut diamond speak to the client? 3 most important elements when pricing any diamonds. As always, Verma Group recommends only purchasing GIA-certified diamonds so you are 100% aware of what you are purchasing and the value is protected. 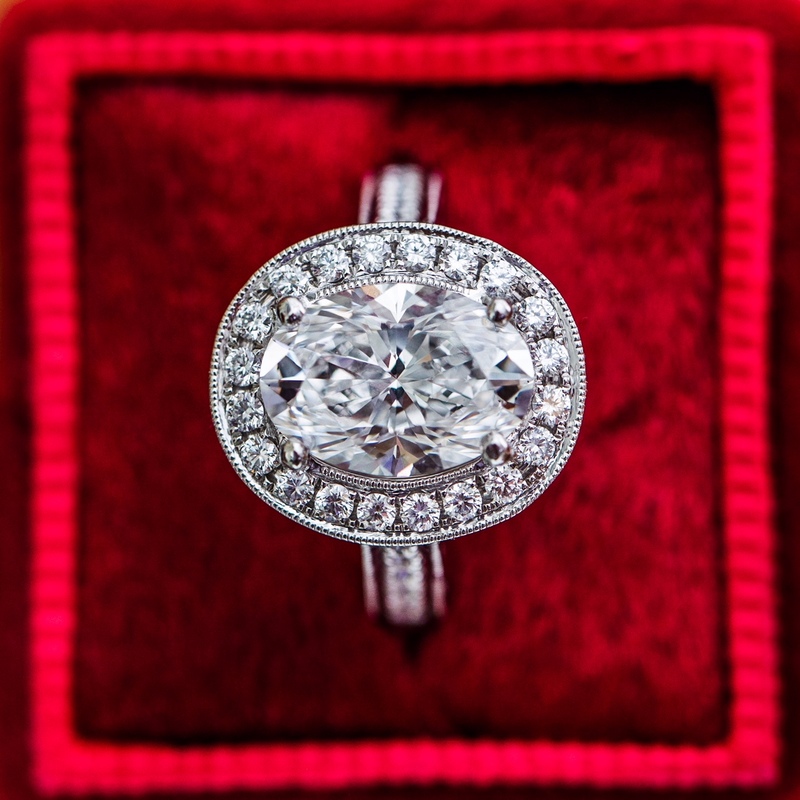 During a diamond engagement ring consultation, we often spend time discussing mounting options. Some clients come to us with a ready-to-go “mood-board” on their Pinterest of all their favorite engagement rings, while others trust us in sketching something amazing and unique for them. In either case, we love creating the perfect engagement ring with the perfect diamond! When explaining mountings to a client, we often refer to it as the “garden” of their home, while their center stone diamond is their “home.” When you buy a diamond, you are often finding a forever piece, much like your home. What you put inside your home or in your backyard can be changed numerous times over the years, much like your mounting. You can change your mounting as many times as you want based on trends and your likes and dislikes. 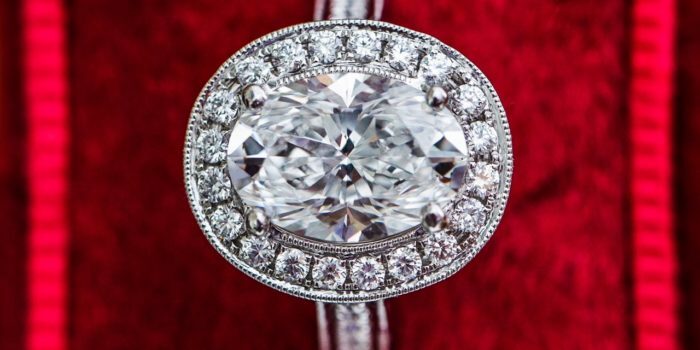 One of the reasons why Oval diamonds are trending and selling so well today is because of the amazing new designs of mountings that are available. Designers are creating such beautiful and intricate never-seen before mountings in addition to the classic ones that we have come to love! Our favorite one currently is the classic halo wrapping around a nice “ideal” ratio oval cut diamond, or an invisible halo. These two designs particularly help accentuate the shape of an already-stunning diamond! As you can see, options are endless! Verma Group would love to help you find you the ideal Oval-Cut GIA-certified diamond for a custom-piece (necklace/studs) or an engagement ring. Contact us today to get started!